I'm a big fan of stovetop macaroni and cheese. 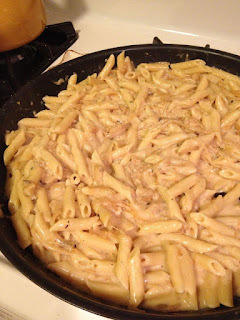 I prefer it over any type of baked pasta because I like the creamy consistency the dish has before it's baked. To get that crispy top that most people love I serve it with a toasted breadcrumb topping that gives a great texture and crunch. This version of mac and cheese has the fun addition of caramelized onions which is the base of one of my favorite soups, french onion. In a skillet, melt 2 tablespoons butter over medium-high heat. Stir in the onions, thyme and bay leaf and cook for 5 minutes; season with salt and pepper. Lower the heat and cook until the onions are browned and softened, 20 to 25 minutes. Transfer to a plate and discard the bay leaf. Reserve the skillet. Meanwhile, bring a large pot of water to a boil, salt it, add the pasta and cook until al dente. Drain and return to the pot. In the reserved skillet, melt the remaining 2 tablespoons butter over medium heat. Whisk in the flour for 1 minute, then whisk in the wine. Let the wine cook down for a minute, stir with whisk so mixture is smooth. Slowly add chicken stock and milk until combined and smooth and bring to a boil; season with salt, pepper and nutmeg to taste. Lower the heat to simmer and cook until thickened, about 5 minutes. Stir in the cheeses until melted. Combine the onions and sauce with the pasta and toss well. If using breadcrumb topping add a sprinkle to the top of the dish and serve the rest in a bowl for passing at the table. Note - To add some texture to this dish I added a breadcrumb topping. I had some extra garlic and parmesan panetini crackers and pulsed them in the food processor and added them to the top. Alternatively, you could sauté 1 clove of minced garlic in 1 tablespoon extra virgin olive oil or butter. Add about ½ cup to ¾ cup panko bread crumbs. Toss with garlic oil and let get lightly browned. Turn off heat and toss with ¼ cup parmesan cheese. It's Dinner Divas time and once again it was my turn to make dessert. The theme was Swedish food which is not the easiest to work with but I was able to find a Swedish dessert thanks to Stacey Snacks! This was easy enough that I was able to make it and not worry too much about it being perfect. It is a very simple rustic dish that everyone seemed pleased with....even though I forgot to peel the apples! Talk about rustic! 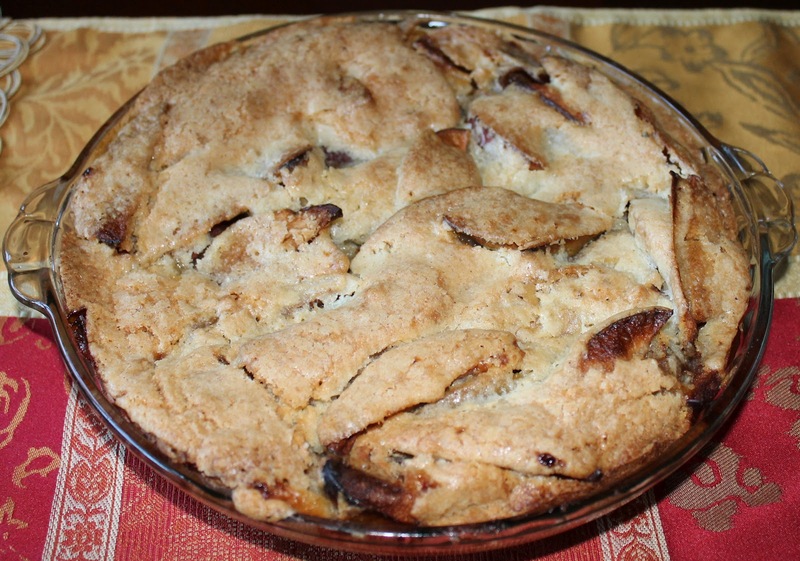 If you ever find yourself with an abundance of apples you've got to give Swedish Apple Pie a try. Preheat oven to 350F. Butter a 9" pie pan and fill with sliced apples & walnuts. Mix the 1/4 cup sugar with the cinnamon and cloves. Sprinkle over apples and coat well. Melt butter and add remaining ingredients (flour, sugar and egg). Pour the batter over apples and spread with a rubber spatula. It's that time again, time for the Secret Recipe Club! If you don't already know SRC is a group of bloggers that are assigned a secret blog and we each pick a recipe from our assigned blog and post it on ours with links to the original source. It is a great way to discover new blogs and have others discover ours. This month I was assigned Pepper and Sherry , a blog from England. This was brand new to me and I there were a ton of recipes I wanted to try. Unfortunately for this blog but wonderful for my business, the past two months have been extremely busy and I hardly cooked much at all. I was planning on making the Cottage Pie because it has so many unique ingredients than what you normally find in Shepherd's Pie, such as dried Shitake mushrooms and a red chile. I will get to this as soon as I can but if you try it before me please let me know. It looks divine! I decided to make Appelmoes also known as Dutch Apple Sauce. I've been wanting to make apple sauce (and baked apples) all season and I loved the spices that are added. I also picked this because my nieces and nephew love apple sauce and eat it as a snack all the time. I thought that they might like to try a homemade version and since I'll be seeing them tomorrow it was a perfect fit. This recipe couldn't have been easier and yet it is still full of flavor. You can eat it as is or use it as an accompaniment to pork or something I love...Pierogies (Steve thinks that is so weird)! I didn't make many changes to the recipe at all. I just left out the cardamom because I couldn't find a small container and I didn't want to buy a big bottle for $7 that I may not use again. I don't think that mattered too much. I also reduced the amount of some of the spices because I wanted to make sure the kids would eat it and it wouldn't be too strong on their delicate palettes. I will post the recipe with my changes but you can view the original recipe (and check out all the other fantastic recipes) by clicking here. Very simply, peel and chop the apples, place in the saucepan with the sugar and spices and only about 1/2 cup of water. Bring to the boil and then cover, turn down to a low heat and cook, covered, for thirty minutes.